When Sony announced its entry into the world of digital SLR cameras in 2007 with the α100, it already had a good lineup of lenses from the Minolta catalogue to bring along with it. Part of this lineup included the subject lens, the 35mm ƒ/1.4G. The 35mm ƒ/1.4G is a full-frame compatible lens, offering a 52.5mm field of view on Sony's cropped-frame sensor bodies such as the α700. The lens ships with the SH0001 petal-shaped lens hood, takes 55mm filters, and is available now for over $1,300. We tested two samples of this lens, as the first sample gave us what we considered to be unacceptably high softness wide open for a lens with this price tag. When the second lens tested identically, we accepted that this is just the nature of the lens. With the lens mounted on the sub-frame α700, we noted very soft results when images were made wide open at ƒ/1.4. Specifically, the majority of the image comes in at around 4-5 blur units, and the corners reach 6 blur units. 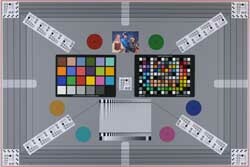 On a full-frame sensor the image corners are even softer, reaching 6-7 blur units on the top of the image, and upwards of 11-12 blur units on the bottom of the image. Stopping down the lens does provide improvement to image quality. On the sub-frame α700 at ƒ/2, the central region of the image - a generous sweet spot in the middle - offers between 2-3 blur units of sharpness performance, but the corners improve only marginally. There's further improvement at ƒ/2.8, but it isn't until ƒ/4 that we see performance worthy of a $1,300 lens, with around 1.5 blur units in the center, and 2-2.5 blur units in the corners. At ƒ/5.6, the corners finally fall below 2 blur units, but there isn't much improvement in the center; ƒ/8 shows a more even sharpness profile. Diffraction limiting sets in at ƒ/11, but at this point we're seeing just under 2 blur units across the frame. Fully stopped-down at ƒ/22, it's around 2.5 blur units across the frame. Mounted on the full-frame α900, the 35mm ƒ/1.4 shows the same improvement, but the corner performance is more startling. At ƒ/2, we note the same improvement in central performance (~2 blur units) and the bottom corners are reigned in slightly, showing ~7 blur units at the top corners and around 8-9 blur units at the bottom. At ƒ/2.8, it's like someone flicked a switch, as the corners are now all in line and under 3 blur units; the center offers that same small sweet spot of performance, at this point around 1.5 blur units, and 2 blur units everywhere else. Stopping down further offers marginal improvements, but it isn't until ƒ/8 that the lens reaches its best performance: around 1.5 blur units in the center, and 2 blur units in the corners. Diffraction limiting sets in at ƒ/11, and by ƒ/22, we note 2.5 blur units across the frame. CA performance is also not very good with this lens: unfortunately, it's worst wide open, where people will want to use it most. The sample images tell the whole story, where magenta color shifts are noted at areas of high contrast. Stopping down to ƒ/4 improves this performance significantly, but compared to modern lenses, the lens falls well short. With the 35mm ƒ/1.4 mounted on the sub-frame α700, corner shading isn't much of an issue - just one instance, where the corners are a third-stop darker than the center at ƒ/1.4. On the full-frame α900 however, corner shading is much more significant. At ƒ/1.4, the corners are 1 1/4 stops darker than the center. Stopped down to ƒ/2, the differential is three-quarters of a stop; at ƒ/2.8, it's a third-stop. At ƒ/4 and smaller, light falloff is marginal. There is some light barrel distortion to note with the Sony 35mm ƒ/1.4, but no more than you would expect in a wide-angle lens. On the sub-frame α700, we note just under +0.25% barrel distortion in the corners; on the full-frame α900, it's just over +0.4%. The screw-driven autofocus system of the Sony 35mm ƒ/1.4 shows the Minolta heritage of the lens. Focus response is fairly fast, taking less than a second to go from infinity to close-focus, but there is some obvious motor noise as it does so. There is no lens extension (everything is internal) and mounted filters won't rotate, making life that little bit easier for polarizer users. Offering just 0.2x magnification, the lens isn't great for macro work, however the minimum close-focusing distance of 1 foot (30 cm) is welcome. The Sony 35mm ƒ/1.4G is a surprisingly heavy lens - just over a pound in weight - finished in a smooth black matte finish. The lens has one button protected by a plastic collar so you won’t press it by accident: the focus hold button. The body mount is metal, the 55mm filter threads are plastic. The lens has a distance scale under a clear window, marked in feet and meters, as well as an infrared index. The lens also features depth of field markings from ƒ/4 to ƒ/22. 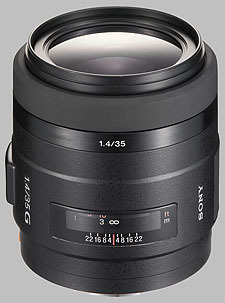 The focusing ring of the lens follows the Sony design, a smooth rubber that is very easy to grip. The ring itself is 3/8'' wide, offering 120 degrees of turning action. This range ends in hard stops, and the lens will not focus past infinity. The action of the focusing ring is smooth but not loose: manually focusing the lens takes moderate pressure to move the ring, and it will not drift off focus. The SH0001 lens hood is petal-shaped, and reverses on the lens for storage. When mounted, the hood adds 1 3/8'' to the length of the lens. Unfortunately, there aren't a lot of purpose-built alternatives for this particular lens application. Short of using body mount adapters to use better lenses from other manufacturers, there are only a few other choices. For sub-frame camera users such as the α700, the Sigma 30mm ƒ/1.4 offers the same wide aperture choice and slightly wider angle, with a significant improvement in large-aperture sharpness. The Sigma offers better tolerance to chromatic aberration, and a much lower price tag as well. There's no full-frame alternative in the 35mm focal length, but if you don't mind a slightly longer focal length of 50mm, the Sigma ƒ/1.4 offers an alternative here. Central sharpness is better at wider apertures than the Sony 35mm, but you still have the same corner softness issues, in the case of the Sigma, wide open, the corners are very soft indeed. That said, with the Sigma, CA performance is good, distortion is what you would expect, though there are some issues with corner shading when used wide open. Again, much less expensive than the Sony. Sony also offers a 50mm ƒ/1.4 option, which we have not yet tested. If you're interested in spending $1,300 on a lens, and you don't need the super-fast ƒ/1.4 aperture, you may want to consider spending a little more to get this zoom lens. The 24-70mm ƒ/2.8 is a very sharp lens, even wide open at ƒ/2.8 - certainly, sharper than the 35mm ƒ/1.4 at ƒ/2.8. For the extra $300 you get both wider and longer focal lengths and SSM autofocusing. The majority of people who are interested in this lens will be looking at its performance wide open at ƒ/1.4, and in this regard, we have a hard time recommending a $1,300 lens. Sharpness performance is quite soft, and chromatic aberration is high; further, on a full-frame body, corner shading is also quite high. Unfortunately, there aren't really any good direct alternatives, so for now, if you desperately want or need this fast focal length, this is what you'll be getting. Otherwise, we would recommend waiting for Sony to update this lens, which seems to be getting a little long in the tooth. Cheap and packers and movers service provider in Hyderabad .if you want to shift one place to another place so call me ya visit our website our network is all over India. Movers and packers in Hyderabad. Center and corner sharpness, bokeh, 3D, color, size. Price, resolution dip in zone B, above average corner CA. This lens is much better that what the MTF make you believe. It has obviously not been designed for macro work, so results up close are not very sharp, though quite artistic. At infinity, it is very sharp across the frame by f/5.6 and is very suitable for landscapes. There is a dip in resolution in the mid frame, probably due to field curvature, but it is barely visible at small apertures. At portrait distances, it has a soft contrast rendition with deep saturated colors and a lot of 3D. Very nice lens altogether. I used to use Canon EOS 5D. I really loved 24-105L, which I think is a great lens except for its distortion characteristics. But when using prime lenses, 5D was really stressful because the focus was so inconsistent under fluorescent light. So I sold it out, and I'm using a900 now and satisfied. but Sony/Minolta lens line-up is not best for that. making Sony 35 f1.4 G look comparatively cheaper. If there was cheaper Sony 35mm f2, I would have bought it.That was the reason why I bought Sony 35mm f1.4G. There was no alternative as the review says. -Ah, I have to say this. In Korea, the used-market price of Sony DSLRs and lenses dramatically drops when you sell it after buying new one while those of Canon retain very high level of used-market price. say the same thing. "We don't recommend it." But I ventured to buy it, and I'm very satisfied, fortunately. Those reviews are talking about poor sharpness of this lens, but upon using it, I feel that the sharpness itself is not that bad, the contrast is low though. It's sharp enough for most applications. Build quality is good, even after considering its price tag. Focus is fast enough, but you need watch out its extreamly shallow DoF. Sony 35mm f1.4 G is very recommendable for those who wants a good 35mm prime. said. "this lens only make sense on a full frame camera." For APS-C users, I think sigma 30mm f1.4 is a better choice in terms of its focal lenth and its price. And you all might know that Sony will release a 35mm f1.8 DT lens soon. I think it's inevitable to compare these lenses. outperforms the Canon 35mm f1.4 L when tested on film. On digital SLR, however, Canon L is an obvious winner as many reviews show. But it is very interesting to note that Sony(or Minolta) 35mm f1.4 G on Sony DSLR is the only way to use that much fast and wide prime with an anti-handshake method. Seeing the SLRGear test of this lens, I had to post a review of my own. First things first: this lens only make sense on a full frame camera. If you have an APS-C camera, get something else. This is a lens for which an optical test will not tell the whole story. I certainly agree with the test from SLRGear, but one has to put the tests into perspective. There aren't that many f/1.4 35mm lenses on the market. There is one from Canon (quite good), there is one from Nikon (old, plagued with coma as it is a spherical design and manual focus only) and there is one from Leica (excellent, at a price). When this lens was designed, the other 35mm f/1.4 were all spherical designs, meaning they suffered from coma (which looks horrible in night photography, the reason this lens was built for). This lens improved considerably on that, while retaining the "look" produced by spherical aberrations: relatively low contrast full open, but with a good level of detail. This is a lens with character. The optical defects, while real, actually improve the look of the pictures in actual use. The low contrast (spherical aberrations) give a "glow" effect for night pictures and mask small skin blemishes. The bokeh and the transition from sharp ot unsharp are very nice. Personally, this is one of my best lenses BECAUSE of its optical imperfections. The only real annoyance is color fringing, but one can correct that in post. Edit: to understand better how this lens works full open, download the VFA target samples. You will notice that the resolution is actually excellent (you can count very tiny lines in the targets, especially in the extreme corners), it is the contrast which is lacking. This is the effect of uncorrected spherical aberration ("veiling"). In night pictures (what you bought a f/1.4 lens for), this is actually often a plus because the contrast of the scene is often too high anyway and because it makes highlights "glow". 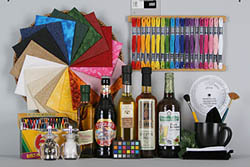 In any case it responds very well to sharpening in post, because the fine details are still there. One should also keep in mind that in real f/1.4 use, the subject is not flat and the depth of field is tiny: bokeh is more important than pure sharpness for an f/1.4 lens. Stopped down a bit, contrast improves markedly. This is a decent lens, mostly plastic yet decently-made. I got one for $300 from a mall store that didn't know what to do with it. Returned it a few days later. It wasn't sharp enough and fast enough to be worth the trouble. Yes you can generate bokeh with it but not much of a 3D effect if any.